Most of the survey data from each of our four regional publications (as well as Energy and Metals Consensus Forecasts™ and Foreign Exchange Consensus Forecasts™) can be received in Excel spreadsheet format by email under license from Consensus Economics. The historical spreadsheet services include Consensus Forecasts™ from our previous monthly surveys dating back as far as October 1989, plus a one-year subscription to the future monthly spreadsheet updates, including a mailed hard copy of the publication each month. These four services (below) allow back-testing of forecast accuracy and modelling of country indicator expectations. Latin American Consensus Forecasts™ – Bi-monthly (alternate months) between March 1993 and April 2001 and monthly thereafter. A flexible TrendCharts feature enabling easy graphic display of the trends in our Consensus Forecasts™ over time has been added to each of the regional spreadsheet services beginning in late 2006. Individual and our Consensus Forecasts™ (mean, high, low and standard deviation) for all of the major countries and indicators as covered monthly in the above publications. Our Consensus Forecasts™ (mean only) for 3 or 4 variables for each of the “Additional Countries” as covered monthly in the above publications. Exchange rate forecasts (mean only) for each of the currencies featured in the exchange rate pages of the above publications. Brent oil price forecasts (West Texas Intermediate before 2013) (mean, high, low and standard deviation) for the forthcoming 3- and 12-month periods, along with the survey date actual spot price. A separate Excel workbook tab devoted to the TrendCharts feature (graph above) which enables easy display of trends in Consensus Forecasts™ over time. An important feature of the spreadsheet format is that the corresponding variables for each country are placed in the same column in each monthly spreadsheet, while the consensus figures for defined variables always appear in the same row. The date of the survey is also shown. It is important to note, however, that the Significant Changes in the Consensus feature (page 2 of the hard copy publication), the special surveys (which begin on page 3), the summary table (back page of the hard copy), all historical data outturns, comparison forecasts, charts and text commentaries are not included in the spreadsheets. Variables covered for some countries may change occasionally, often due to country practice (a record of these is available to subscribers). Excel spreadsheet data is delivered to clients of this service by e-mail on the day a publication is released. Further details can be obtained by contacting Consensus Economics. Prices (which include a hard copy subscription) are as shown below. Certain UK and European Union subscribers to these services may also be charged Value Added Tax. 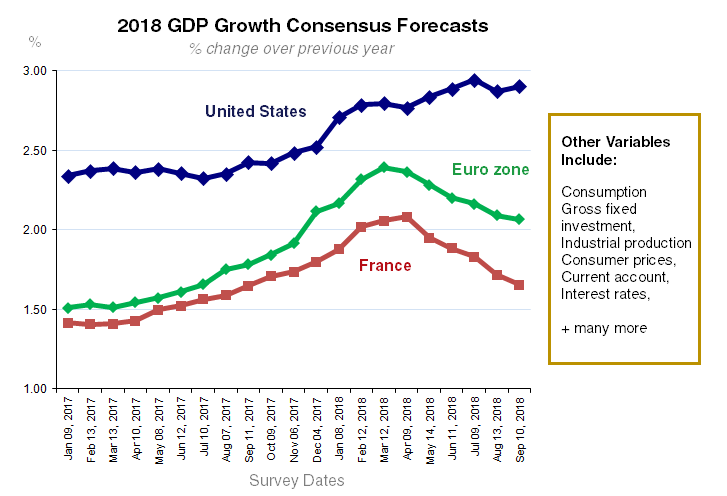 Consensus Forecasts – G7 and Western Europe – US$6580 or £4685 or €5680 (excluding VAT, if applicable) per year for historical forecasts from previous surveys including future monthly updates for one year, or future monthly updates only at US$1680 or £1075 or €1190 per year. Asia Pacific Consensus Forecasts – US$4588 or £3277 or €3955 (excluding VAT, if applicable) per year for historical forecasts from previous surveys including future monthly updates for one year, or future monthly updates only at US$1679 or £1079 or €1189 per year. Latin American Consensus Forecasts – US$4336 or £3096 or €3737 (excluding VAT, if applicable) per year for historical forecasts from previous surveys including future monthly updates for one year, or future monthly updates only at US$1533 or £993 or €1163 per year. Eastern Europe Consensus Forecasts – US$3544 or £2544 or €3055 (excluding VAT, if applicable) per year for historical forecasts from previous surveys including future monthly updates for one year, or future monthly updates only at US$1487 or £897 or €1127 per year. In addition to receiving the historical and current survey data directly from Consensus Economics, these databases are also available as premium services on FactSet, on Macrobond, on Refinitiv Datastream, and on the RIMES electronic research platforms. For further information about these services, please contact Consensus Economics. Consensus Economics also undertakes polls for long-term forecasts, quarter-by-quarter forecasts and other related topics.